Old habits die hard in this safety-first JRPG. A JRPG for people who haven’t played one in a while, basically. Well-made, but disappointingly safe. From its glossy CG intro to its quaint pastoral villages, its range of regional British dialects (with the odd cod-European accent) to its slightly tinny MIDI soundtrack, Echoes of an Elusive Age is a Dragon Quest game, all right. With the series finally making its debut on PC, it’s a belated opportunity for many to see a genuine Japanese phenomenon in action—and yet you might well wonder what all the fuss is about. For better and worse, this is a stubbornly orthodox JRPG: even if you’re not familiar with the series, you’ll surely get the feeling you’ve been here before. For some of you—especially those who haven’t played a good old-fashioned turn-based role-player in a while—that might as well be a glowing recommendation. Like pulling on a tatty old jumper you’ve just found screwed up in the bottom of your wardrobe, there’s every chance those early hours will give you a warm, enveloping feeling, perhaps even a few misty-eyed memories of happier times. Sure, the story might be a little threadbare (young male hero with mysterious power sets off to save his home and, by extension, the world) but there’s an abundance of colour and cheer in this world, right down to the first enemies you meet—those iconic blue Slimes bouncing up to greet you with a welcoming smile before you promptly slice them to bits. There is a handful of forced fights, usually boss battles at key points in the story but there aren’t any random encounters: you can see the various monsters walking or hovering around, letting you choose which ones you want to engage in battle. This is one of those JRPGs where you explore a large but not-quite-open world, with enclosed areas connected by loading screens and cutscenes. Nevertheless, they’re roomy enough to stretch your legs and offer plenty of distractions and hidden treasure away from the path leading to your next waypoint. It’s a pretty, inviting world, too: the towns are pleasantly busy, with a diverse range of architectural styles that helps give them extra personality, while outside you’ll find flourishing fields and tangled caves. The monsters within them are nicely drawn and brilliantly animated. There’s often a slapstick punchline when you defeat them, whether they do a backwards roll before collapsing or clonk themselves on the head with their own weapon, and their names are often glorious (or groanworthy, depending on your tolerance for puns). But for long stretches of the game, you can breeze through the lot of them, automating your battle strategy so you can simply press a button to kick things off and then watch as your party of four wins without breaking a sweat. You’ll have to take the reins for boss fights, if only to make sure you’re healing at the appropriate time, but most of these are simple, too. Only towards the end are you invited to think more tactically—harnessing the combination attacks that emerge when your characters randomly get fired up—but by then you’ll have unlocked the more powerful moves on everyone’s skill tree, so you’ll often find yourself repeating the same attacks to get by. Again, that won’t be a problem for everyone. But if streamlining the usual JRPG grind sounds appealing in theory, it doesn’t stop the game from being interminably slow at points. It’s not so much the fault of the cast, who make for fine companions: with a few exceptions the characters are well-written and the voice acting is great. And it finds clever ways to add spice to the generic ‘find the magical orbs’ objectives: in one episode, you’re forced to cover for a timid prince, while another sees you enter a fighting tournament where competitors keep mysteriously disappearing. But everything drags on longer than it needs to, occasionally to almost comic degrees, whether it’s piling setback upon setback, or simply stopping a cutscene so you can walk forward ten steps to trigger another one. Given the series’ success in Japan, you can understand why its makers would be reluctant to mix things up. There are a few attempts to change things, but they’re all slightly half-hearted, and one is a total bust. The default combat camera lets you adjust your viewpoint with the right stick and reposition your characters with the left, yet there’s no mechanical advantage to doing so. So why bother? Stick with the classic camera option and battles seem far livelier and better presented. 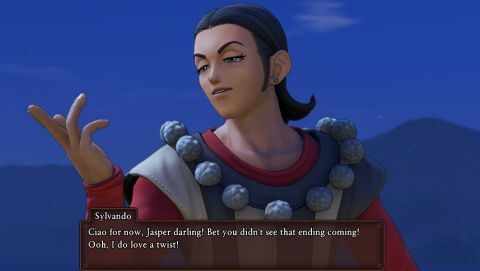 If this is the kind of half-hearted addition that passes for innovation, then maybe it’s for the best that Dragon Quest 11 otherwise sticks to the script. For details on the PC port of Dragon Quest 11, check out our impressions from last week.